“All they who receive this priesthood receive me, saith the Lord” (D&C 84:35). Lindsay felt nervous as she looked around the hospital room. She knew that soon someone would come to take her to the operating room for surgery. Mom and Dad stood close to her bed. A few days before, Lindsay’s family had had a special family home evening. Mom gave a lesson about priesthood blessings. Then each member of the family told about a time when he or she was blessed by the power of the priesthood. Lindsay felt peaceful and happy as she listened to their testimonies. Mom explained that the peaceful feeling was the Holy Ghost telling Lindsay that what she was hearing was true. At the end of the lesson, Lindsay’s older brother, who held the Melchizedek Priesthood, put a drop of consecrated oil on her head and said a prayer. Then Dad gave her a wonderful blessing. He said that Heavenly Father knew and loved her. He said that the doctors would be blessed in their work and that the surgery would go well. He also promised that Lindsay would have a special feeling of comfort and peace that would replace her fears. Waiting in the hospital, Lindsay tried to be brave, but tears slowly leaked from the corners of her eyes. Two men in hospital clothes came into her room and said it was time for the surgery. They were kind as they tried to cheer her up, but still Lindsay’s fear did not go away. Lindsay hugged Mom and Dad from her bed. Then one of the men pulled up the railing on her bed so she would be safe as they wheeled her down the hall. As Lindsay turned to see what he was doing, she saw a familiar silver ring on his finger. A warm, peaceful feeling filled her heart as she saw the letters CTR on the ring. Lindsay smiled as her fears slipped away. She knew that everything was going to be fine. Elder Dallin H. Oaks of the Quorum of the Twelve Apostles, “He Heals the Heavy Laden,” Liahona and Ensign, Nov. 2006, 7. Many people and things give Lindsay comfort and support. 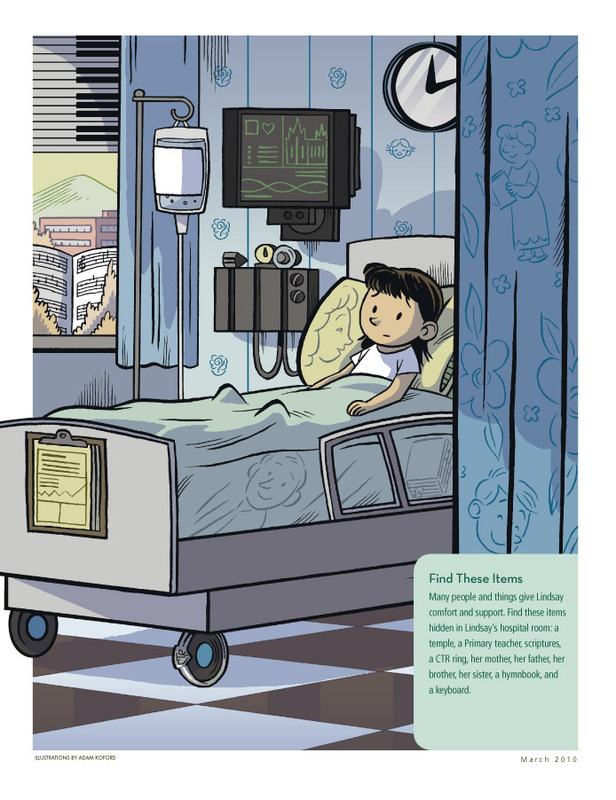 Find these items hidden in Lindsay’s hospital room: a temple, a Primary teacher, scriptures, a CTR ring, her mother, her father, her brother, her sister, a hymnbook, and a keyboard.